Last day of work here at the sitcom. My desk is cleaned off, the final script is sitting next to me, and I’m watching my calendar fill up. But don’t cry — you’re totally invited! 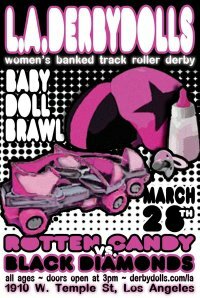 On Sunday, March 28, the L.A. Derby Dolls will feature up-and-coming skaters in 2010’s first BABY DOLL BRAWL, open to all ages at the Doll Factory (1910 W. Temple Street 90026). Bring your family for a full-length bout featuring L.A. Derby Dolls’ newest skaters and future stars. The teams are Rotten Candy (PINK) v. Black Diamonds (BLACK). Halftime entertainment will be the L.A. Junior Derby Dolls, the first banked track junior derby league for girls ages 8-17 in SoCal. Baby Doll Brawl general admission tickets are $10 and VIP tickets are $20; for children under 10 general admission is free and VIP is $5. Buy tickets online here. Wear black to support my team, Black Diamonds. Sulfuric Astrid and I are going for our fourth straight Baby Doll Brawl victory, or as we like to call it: THE FOURPOCALYPSE. Previous Article Unsent Love Letters: It’s Different at Sixteen. Next Article Weeeee! You I You Weeee Meeeee Meeee! Youuuuu! They You I Meeeeee They Us!